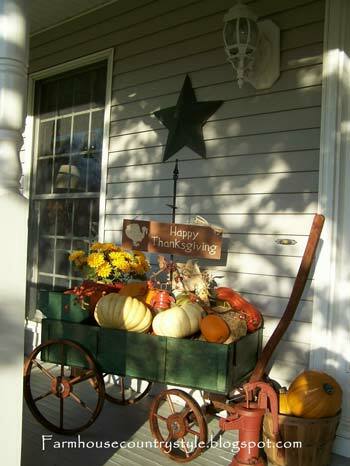 We know you will love Dee's country farmhouse. 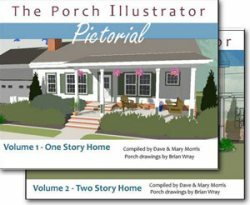 Not only will you see seasonal front porch decorating at its nicest, but you will hear in Dee's own words the love and memories found on her porch. 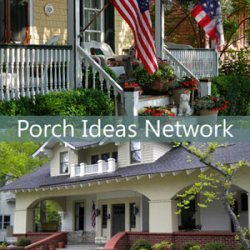 Dee, author of the heart-warming blog, Farmhouse Country Style, is graciously sharing her country porch with us in pictures and words. 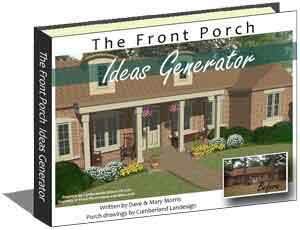 Sit back and enjoy, in Dee's words, how she feels about her farmhouse porch. I'm so happy you have come to visit our country farmhouse. Come and sit a spell. My husband and I, along with our three children, have called this home for over 10 years now and have loved it up as best we could. Our country farmhouse sits on the property of a one-time flower farm. 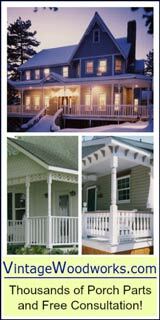 One of the most prominent features of this style of house is the front porch. 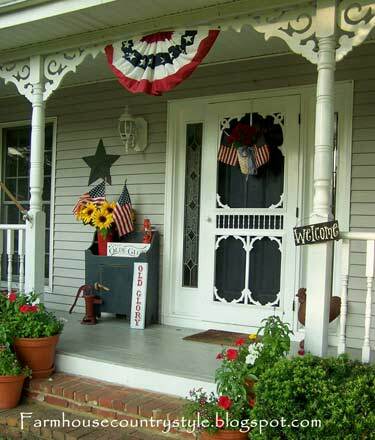 What is a country farmhouse without a front porch? It stands with welcome arms as you walk up to our creaky screen door and it beckons you in. 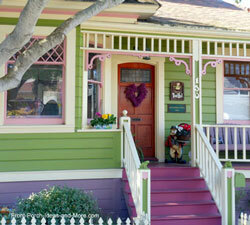 We have held many a tea party on our porch when my girls were little. In the early summer days, before the heat, setting tea out on our old wicker set was so enchanting. We would pretend we were from Anne of Green Gables, my daughters were little ladies. Sitting on our front porch, the world seems to take on a different time and place, a more simple and relaxed time. When the wicker became worn we replaced it with black rockers, one for each of us. Rocking on the porch you can watch any summer evening storm with fireflies dancing by your head while the lightening splashes across the sky before you - safely there on the porch. My middle daughter thought the porch a fine place to set up her dolls for an afternoon of fun. She would sit out there for hours and I could listen to her safely playing through the screen door and windows. My son, the youngest, now plays there with his trucks while he patiently waits for his sister's bus to bring her home. Summertime spent sitting on the sunny porch steps with a glass of lemonade watching my children chase one another with a hose or simply blowing bubbles. Playing tag in the front yard, the porch is always a safe home base! 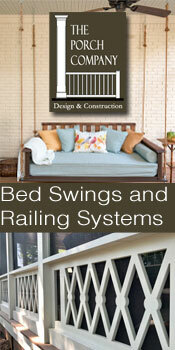 Parades watched from the comfort of our porch. First day of school pictures are always on the front porch. On a snowy winter's day the porch becomes a valet for boots and wet mittens awaiting the children to come back outside from warming their rosy cheeks. Our porch seems a little weathered these days, it is real wood you know. 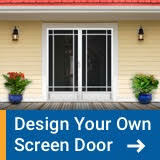 As tempting as it is to want to dare think about the plastic porches that are available today for their low maintenance qualities, I really wouldn't change ours even if it was free. It has character just the way it is. A few of the floor boards need repair and the paint is chipping here and there and will need to be repainted in a couple more years, a strenuous and lengthy job, but a loving process nonetheless. Because you see, it is in the very worn spots before the front door that I am reminded of all the love we receive here in our Country Farmhouse. 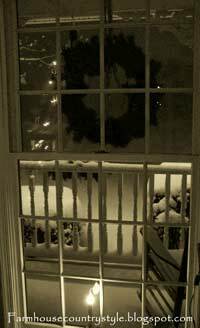 Evening porch at Christmas time - a wonderful place to call "home"
The wearing from arriving home daily from long days and the visitors of family and friends along with all the afternoons spent playing on that porch. That can only mean the front porch is where love arrives at our home and we love this country porch we have been so blessed to own! Our Many Thanks to Dee! 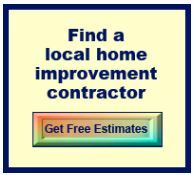 Dee says: "I am a country sign making, stay at home momma, to my three beautiful children. Married to my loving husband for 16 years, together we are raising our family in our cozy country home. I feel blessed beyond measure and enjoy sharing pictures of my home, family, and daily life on my blog. 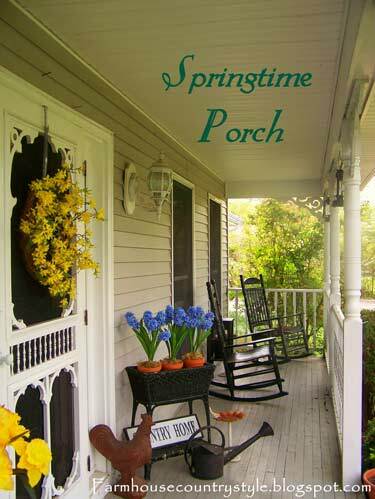 Stop by my blog for a visit when you have the time…..come sit a (virtual) spell on my farmhouse porch. I am always happy to have you!" 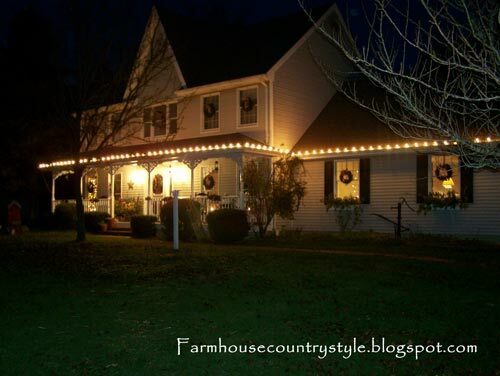 Learn more about Dee's life in the country at her blog, Farmhouse Country Style.